Father of the Groom gives us praise! We regularly receive amazing praise from our couples, but it’s even more exciting to receive a review from a Father of the Groom from an amazing wedding film that we shot at the exclusive Newport Country Club in Newport, RI. 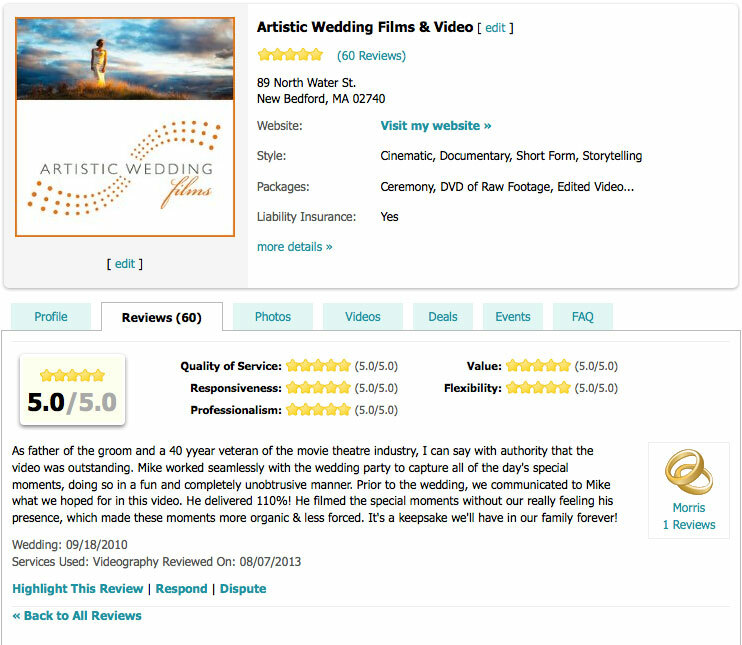 Yes you saw that correctly, the Father of the Groom sent us a great review! We were already honored to have been asked to shoot Stacie and Matt’s wedding by Matt’s mom Judy, she is the owner of Papers a well respected invitation store in Newport, RI. So to have received such an amazing review by Matt’s Dad, who you will see from the review has years in the movie and theatre industry, was such an honor. Thank you again to Stacie and Matt’s family for having us produce your film, it was such an honor and the day brought us such amazing light. BTW, we have been using Stacie’s image as our ad for the last year or so, the light was so gorgeous the day of there wedding. We have been honored with a membership into Style Me Pretty’s Little Black Book!